Whether it’s the anticipation of Santa coming, the arrival of extended family, or the smell of your Christmas ham or turkey roasting in the oven, Christmas Eve brings much excitement and joy to families, especially to young children. While many traditions are upheld over the years and all families are different, we encourage you to try this easy marshmallow making activity with your children this year. You’ll have a blast making them for your kids. Perhaps it’ll turn into a new family tradition for you? Bring 1 cup of water in a large sauce pan to a soft boil over medium heat. Make a double boiler by placing a glass bowl over top. Make sure the bottom of the bowl does not touch the water. Add chocolate chips to the bowl and allow to melt, 2-3 minutes. 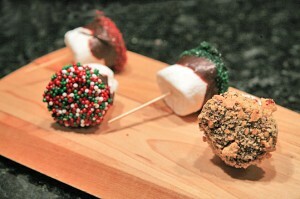 Remove the marshmallows from the bag and place a toothpick in the center of each one. Once the chocolate is melted, add a splash (or two) of half & half and stir to combine. Pour your colored garnish into small ramekins. 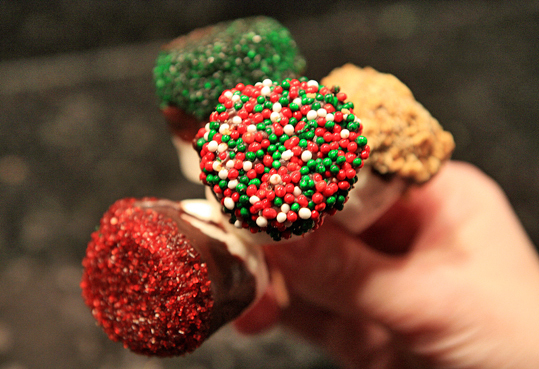 Holding the “snowmen” by the toothpick, dip into the melted chocolate. Allow to drip for a few seconds and then dip the tops into the desired garnish. Place garnish side down on a baking sheet lined with parchment paper. Once you are finish, move the baking sheet into the freezer and allow to set up for 30 minutes. cant wait to try them! !